And then there is the issue of Amoureuses. Early last year, Decanter magazine published an article profiling Francoise Vannier-Petit, in which the geologist noted that the soils of Amoureuses have “only 10cm–15cm of soil above the subsoil”. It was in the context of another subject, so nothing was mentioned about the stone below, but given this lack of topsoil over Amoureuses, I would not expect a hard stone like Comblanchien to lie below just below the surface. This is a stone prized by architects and designers for is grains so fine that it is virtually impervious to water, for its immense strength, and its high levels of elasticity, all which are due to its nearly pure 99% calcium carbonate content. In other words it is very resistant to fracturing. But that is just what two of the premier experts on Burgundy, Clive Coates and Remington Norman, have written: Comblanchien lies below Amoureuses. Amoureuses hangs off of Le Musigny like a broken appendage, with topography unlike any other vineyard in Burgundy. I first became aware of this reported bedding of Amoureuses, when Neal Martin, in his introduction to reviewing the wines of the vineyard, mentioned that the vines were planted to a bedrock of Comblanchien. It seemed that this information could not to possibly be true. This stone’s ability to resist fracturing was proved again and again in quarries across the Côte. I emailed The Wine Advocate, suggesting this information may not be correct, and if they had a geological source for that information. I was beyond curious. Neal Martin kindly responded, citing Clive Coates’ book, “My Favorite Burgundies”. This would come up again once I finished Part 1.2 of this series. In the comments section, a very knowledgeable reader, Victor discusses that both Coates and Remington Norman claims Comblanchien lies beneath Amoureuses. So it was time to search out Coates’ now oft-mentioned passage. It follows. In considering what he wrote, these are my takeaways: The limestone debris he writes of, typically would have slid downslope from above, onto Amoureuses. However, if the stone was significantly fractured, and with 10 to 15cm of soil, at some of this colluvium could have been developed in situ. It is very likely that centuries of farming would have churned up stone below to combine with debris accumulated from other locations. When he talks of the limestone being less active, he is referring to the fact that the gravel and stone of the vineyard is tightly pored, causing it to resist chemical weathering. This would be consistent with a very tightly grained, limestone with a very high calcium carbonate content. 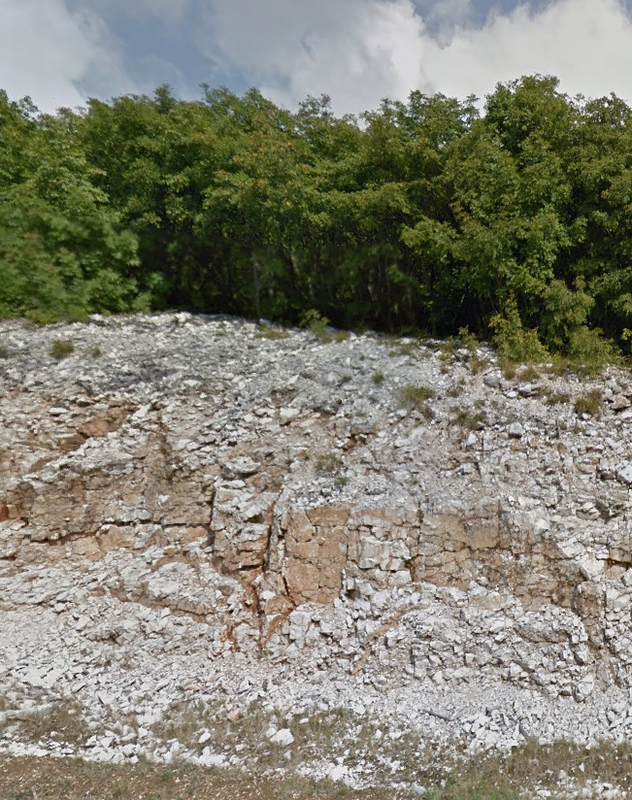 This is certainly a clue pointing toward Premeaux or Comblanchien limestone as the base for the colluvium. It means the calcium carbonate is not as active in becoming solvent due to carbonization, and very little clay is being formed at the site. It may also mean that the soil has a lower pH than other vineyards in Burgundy. This is all covered in-depth in part 2.1. With all that description, however, he never mentions any fracturing to the “mother rock,” and at least to me, this is the key the issue at hand. If the stone was indeed Comblanchien, then it would have to be significantly fractured for vines to grow there. Given that in all of Gevrey, where there is significant Comblanchien, the stone is never present where the soil was shallow. 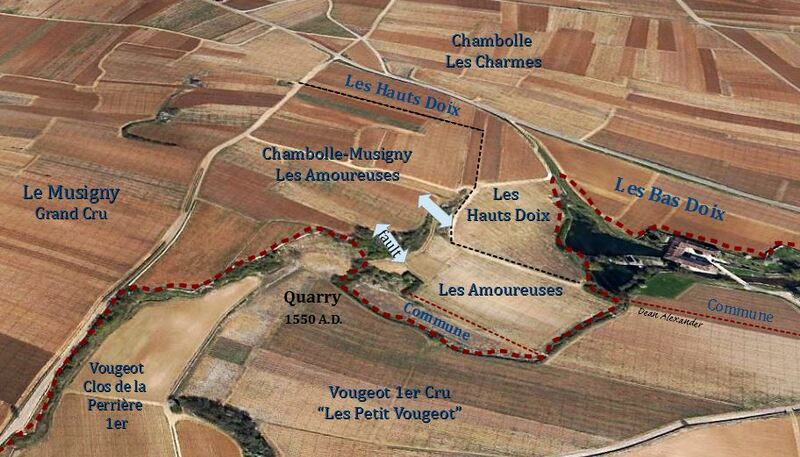 Further bolstering my doubt, was that stone had been quarried only a matter of feet from the vines Amoureuses, where the premier cru vineyard of Vougeot “Les Petit Vougeot” is located today. The stone cut from Les Petit Vougeot site was used for the construction of Abbaye de Cîteaux, which after the revolution in 1790, was seized from the church and renamed the Chateau de Clos Vougeot. Certainly, the Abbey wasn’t built out of fractured and crumbling stone. If the limestone in Amoureuses is, in fact, a hard stone, much less the hardest stone, the base rock could not just have a few fractures. It would have to be shattered. I was virtually sure the stone had been misidentified. 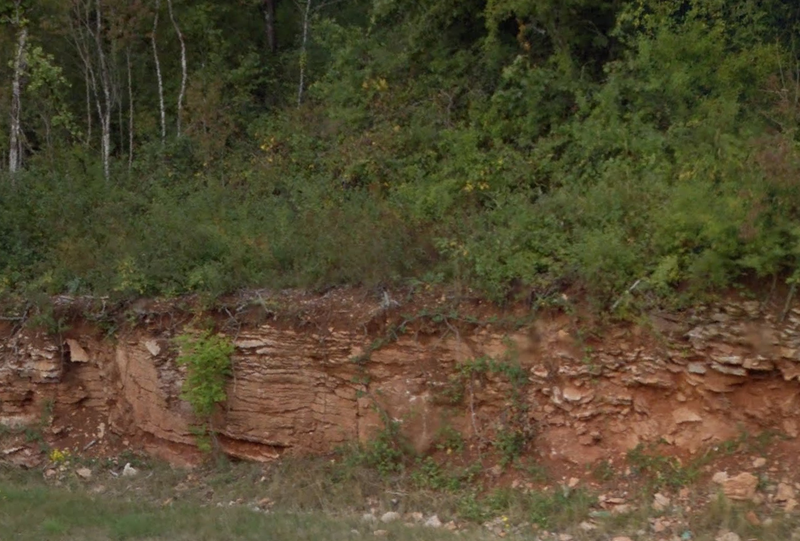 However, a very visible fault cuts through the vineyard that seems to end abruptly at the quarry site. The lower section of the vineyard having been torn away, and down from the upper portion. This required extensional stress, the kind which is most damaging to stone, literally pulling it end from end. From that extensional stress, we can expect deformation and fracturing throughout the stone structure, on either side of the fault. We also know that the longer the elastic range of stone (and Comblanchien is very elastic due to its 99% calcium carbonate content), the shorter the ductile deformation range. In other words, like a rubber band, it will stretch significantly before it snaps; but when it does, it will snap suddenly. Topographically speaking, there are no other vineyard locations in the Côte de Nuits-like this stair-stepped vineyard, save Haut Doix which is joined at its hip. They are remarkably unique vineyards for the area. Certainly, something geologically special had happened here. So with no more information, the question of Amoureuses remained open. But perhaps I would be able to answer the question whether it is possible to plant vines in shallow soil above Comblanchien, or in other words, remove my doubt. I would begin a look for examples of Comblanchien at shallow depth in other vineyards…and I really wanted to know what shattered Comblanchien might look like. I would find answers to both. The vineyard En la Montagne sits near the mouth of the Combe du Pré, a large ravine or valley, just north, above this photo. Interestingly, but not unusual, the map shows vineyard plots that don’t seem to exist. According to the map, there should be a small sliver of a vineyard between the two vineyards on the upper right of the photo, but I can detect none from satellite images of the region. There is nothing but continuous forest in that location. 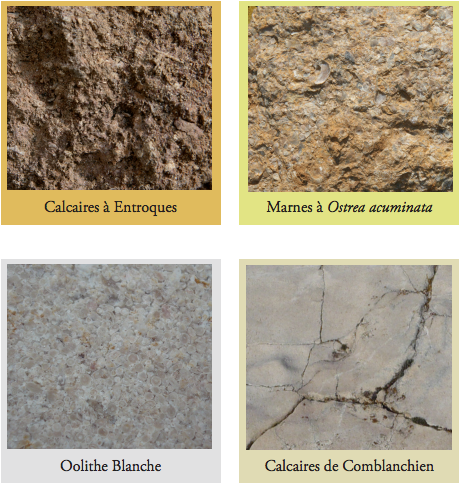 Geologist, Francoise Vannier-Petit’s work in Marsannay was commissioned by the regional trade organization, the Organisme de Défense et de Gestion de l’AOC Marsannay, and the results were released to the public in March of 2012. This information was assembled for a public relations brochure, developed to support the organization’s application for gaining premier cru status for various top vineyards within Marsannay. I had discovered the publication (which is entirely in French) in June of 2014 but had really only inspected the sections germane to our producer of Marsannay wines, Domaine Joseph Roty. In truth I had completely forgotten I had this information in my possession, until I started to wonder if Comblanchien could be found in Marsannay, an area Vannier-Petit had surveyed. Apparently, there is an English version available but have not been able to find it. Regarding Marsannay in general, she brings up some really interesting observations I had never seen in regards to Burgundy. 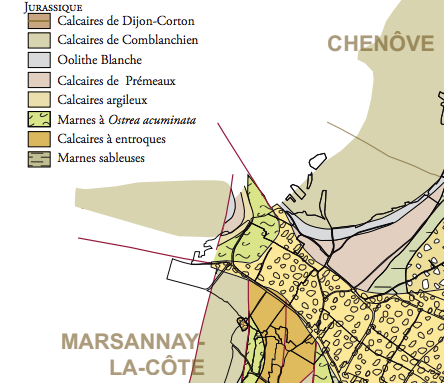 This is relevant because many authors have mentioned that Marsannay and Gevrey are very similar in terms of soil types. Clearly, the google translation is not perfect, despite this, it is of considerable interest that she mentions that the “clay-limestone alterations” are “intensely fractured”. Within this paragraph are several illuminating concepts that I have never read before regarding Burgundy, and are very likely a significant factor understanding soil production for the Côte. The first mention is of fractured marl (small limestone particles mixed with clay), indicating this was marl which over long periods had been indurated (hardened) by geologic pressures. Marlstone was a favorite building material of the Romans, who prized it for its workability, but it is more prone to fracturing and chemical weathering than limestone. This is likely due to its relative porosity, as well as its weaker chemical bonding of the mixed materials that make it up. Also mentioned in the next sentence is layers of clay which also had been indurated into claystone. Claystone, which is harder than steel, can fracture due to hydraulic expansion as it gains moisture. Further frost wedging and can shatter into many small, hard fragments which can be dispersing throughout the soil. If it is chemically weathered, it can regain its plasticity, and return to its clay form. 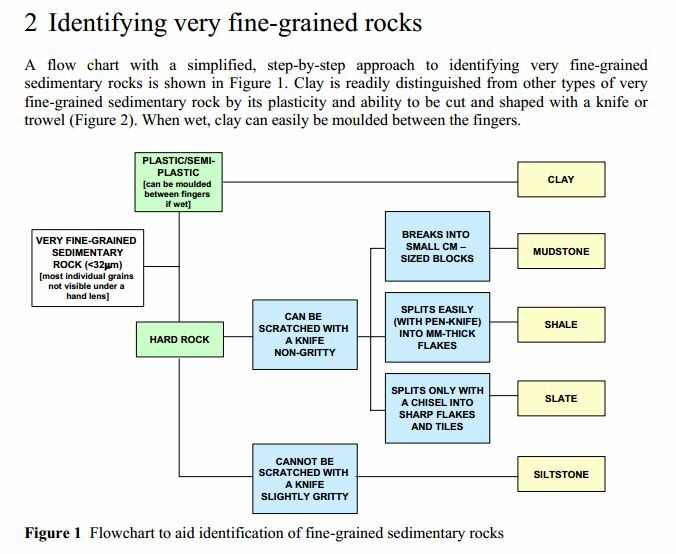 Much more about the formation clay and its close relationship to limestone in Part 2.1. Now depending on the amount of silt (particles of feldspar and quartz that are larger than the particles of clay) mixed into the clay, this hybrid material can be termed as mudstone. Mudstone which is made up of many fine layers is considered to be laminated, and if it can be split into many layers, it is considered to have fissile. And just like that, we are now talking about shale. The relationship between these materials is so close, that through mechanical and chemical weathering, the shift forms from one to anther, and back. While a couple of other vineyards had notable amounts of Comblanchien low on the slopes where there would be deeper soils, these were not of interest. Only the only the upper slopes where the soil would be shallow like Amoureuses were relevant. One vineyard, in particular, fits the criteria, En la Montagne. En la Montagne is in the northern most section of Marsannay la Côte, the largest of the three villages that are entitled to use the name Marsannay. 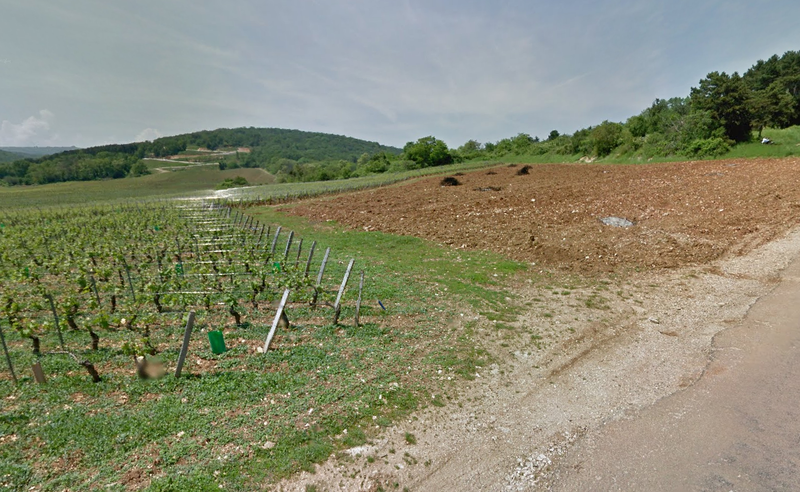 The vineyard sits just below the mouth of an enormous ravine, the Combe du Pré. Several of these ravines cut through the significant hills above Marsannay, and are have a significant impact on the wines of the region, having spilled wide areas of alluvial soils across swaths of vineyard land, and allowing air to travel easily east-west through their openings, cooling the region. 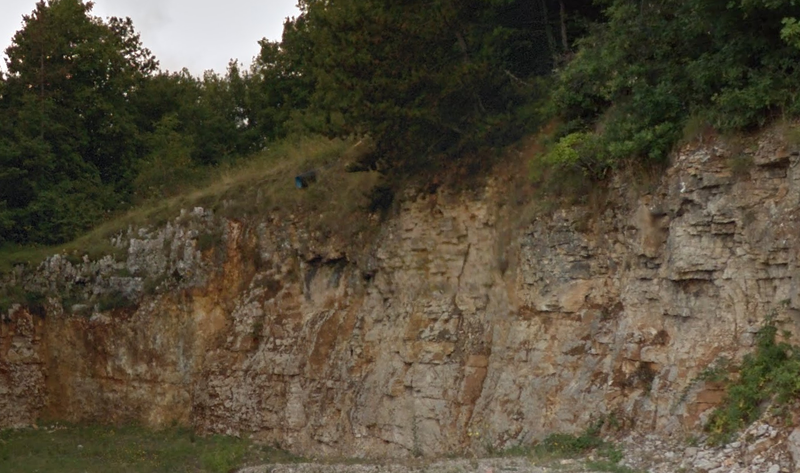 The hillside has a pair of significant faults which water likely exploited, cutting through the hillside, creating the Combe du Pré via thousands, if not hundreds of thousands of years of constant erosion. 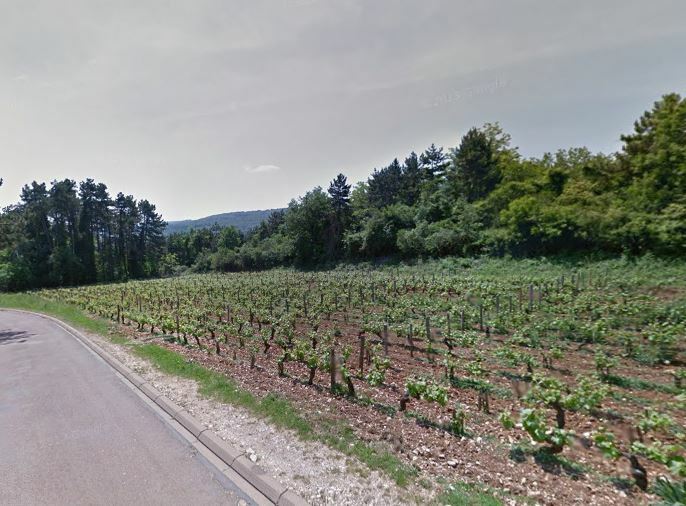 Located at the top of the hillside vineyard between Chenôve and Marsannay-la-Côte, the place called “In this Mountain” (En la Montagne) a large topographic variation, from 292 to 354 meters above sea level, with an average altitude of 315 meters. The slope is small foot hill ( 3%) and high hillside high (12%) , with an average value of 5%for the locality. The climate is south facing. La Montagne is based exclusively on limestone bedrock. The limestone Prémeaux, white Oolite and especially the Comblanchien provide abundant clear stones and a very thin soil. Clear stones, I can only assume means thant they are free from impurities, and are nearly pure in calcium carbonate. Upper slopes of La Montagne. The slope is more gentle than the name suggests. You can see D108 winding up the hill in the background. The vineyard itself is quite small, with a flat section at the bottom, and a relatively short rise before the tree line. I would not expect exceptionally shallow soils due to its relatively gentle rise of 3%. This rise is where the Comblanchien lies. The slope rises more steeply once in the trees. The small plots above, which also have Comblanchien as bedrock are not significantly steep either, however. The vineyard section in the photo below looks to be around 4% to 5% near the top, but the bottom it looks to be a bit steeper. An upper plot of la Montagne which is over Comblanchien. This looks to be 7 to 8% grade near the bottom, and more like 4 to 5% toward the top. Ironically, this road leads to a small public drop off point for garbage. 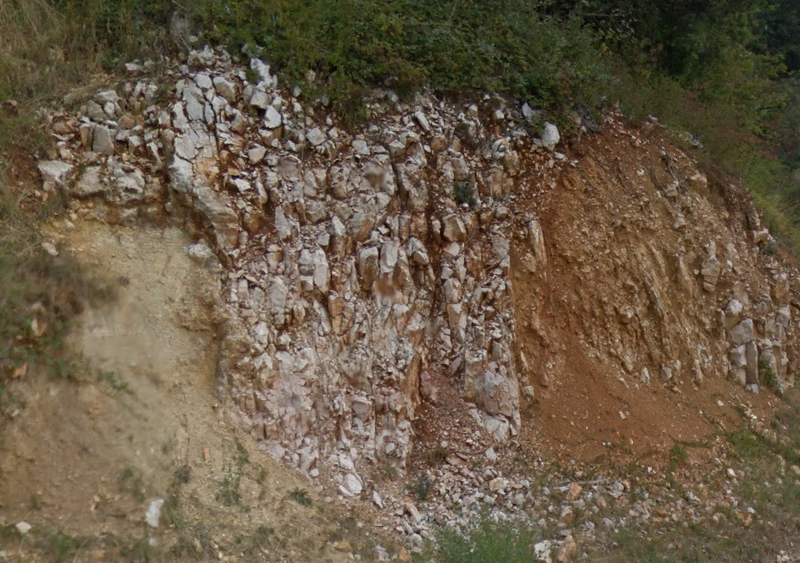 While it there are no direct correlation that made from en la Montagne to les Amoureuses, as their circumstances, soil and locations are very different, the existence of Comblanchien below this vineyard and the highly fractured Comblanchien in the hills above, certainly gives evidence that Comblanchien is no more immune from severe fracturing than any other limestone, given the right circumstances. Yes. Amoureuses could very well be fractured Comblanchien. 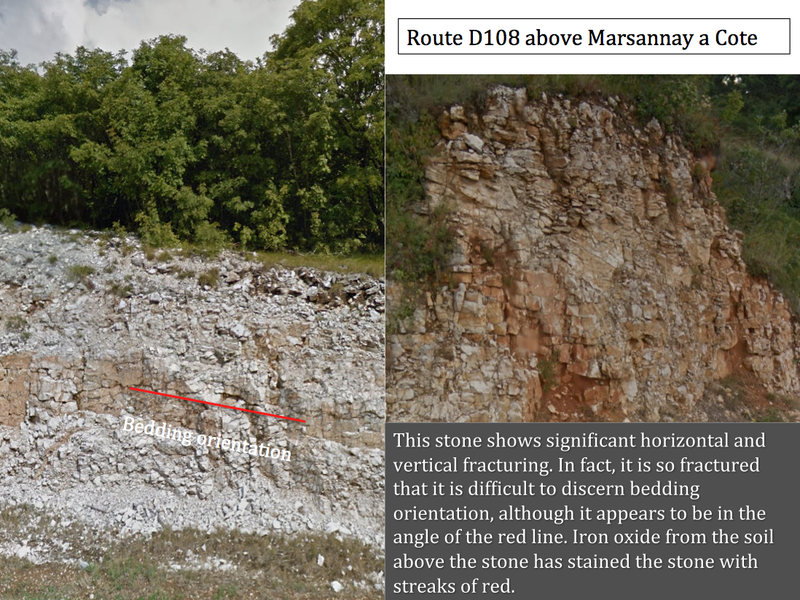 Additionally, the photos below show that while significant fracturing can occur in one location, the stone, just a few yards away, may remain intact. 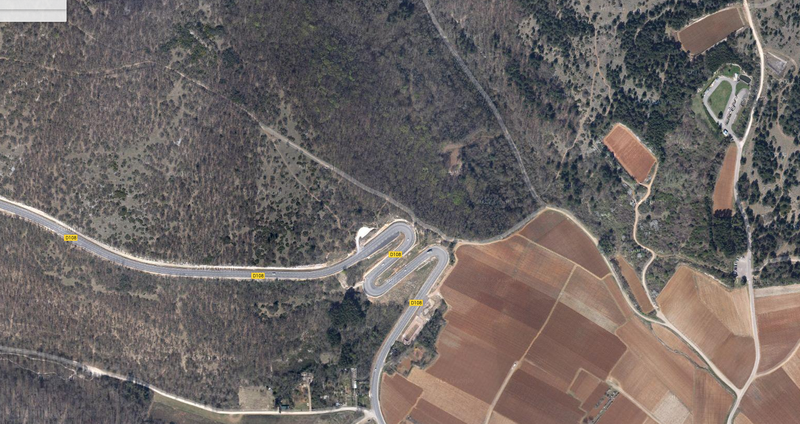 La Montagne to the right and the road up the combe to the left. Author’s Note: Vannier-Petit is credited at the end of the publication as being responsible for the conception and information in the brochure, so I have accepted the words within it as if she were the author, which is likely not the case. “In the rest of the climat( referring to Musigny), the subsoil is rock riddled with veritcal crevices which the roots of the vine use to descend more than ten meters, as one can see at the base of the climat of Amoureuses”. I take this passage as saying that the Comblanchien underneath both Musigny and Amoureuses is highly fractured, as you surmised! Hi Victor, I just noticed this post on the French Wine Society piece saying there are two major underlying “subsoils” in Amoureuses. Of course it is not mentioned which kind! Here is the link.